Unless you’re sitting in front of a spread at Waffle House, nothing will remind you of a hearty breakfast like these bacon and maple syrup lollipops from Lollyphile. Or maybe you like your suckers a little bit on the wild side. In that case, they also have a confectionery masterpiece called the Absinthe lollipop. As for the breakfast variety of sucker, the main ingredients are just as genuine. 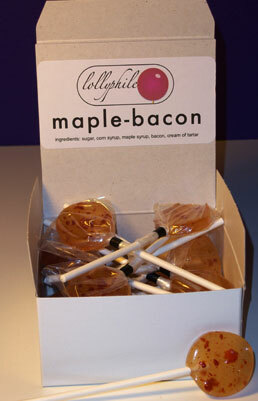 Made with pure Vermont maple syrup and sustainable, organic, cured bacon — these lollipops are practically collector’s items! Hope you can afford the price tag though: 4 for ten bucks is a bit more expensive than your average Tootsie Roll pop. Grab ’em while you can. Or settle for an anatomical heart made of candy.